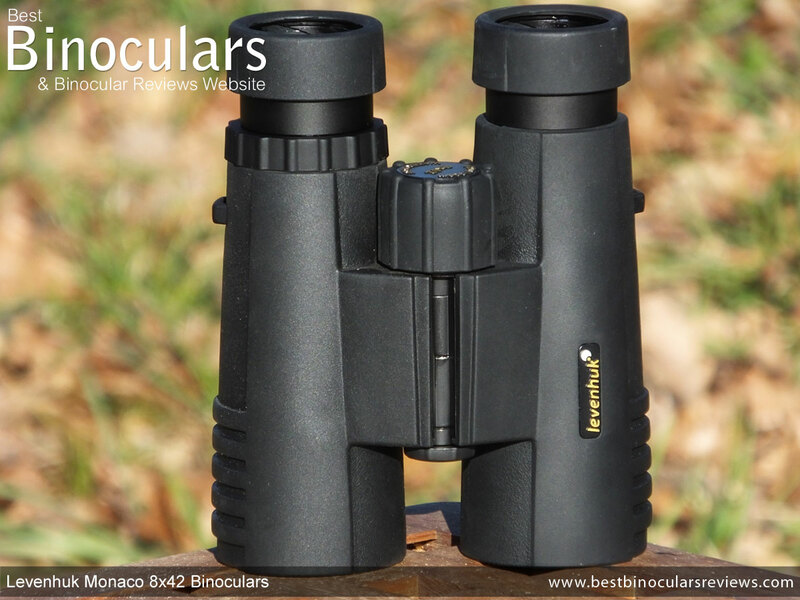 The Monaco series from Levenhuk consists of six models of mid-level binoculars that look to me to be aimed at those looking for a high level of performance, but are also on a fairly tight budget. This sector is really difficult for manufacturers to get right. I say this because on the one hand you have a more knowledgable consumer that is expecting and indeed demanding an instrument that is of a higher quality and offers tangible improvements on budget range bins, yet at the same time we are looking to spend as little as we can get away with. 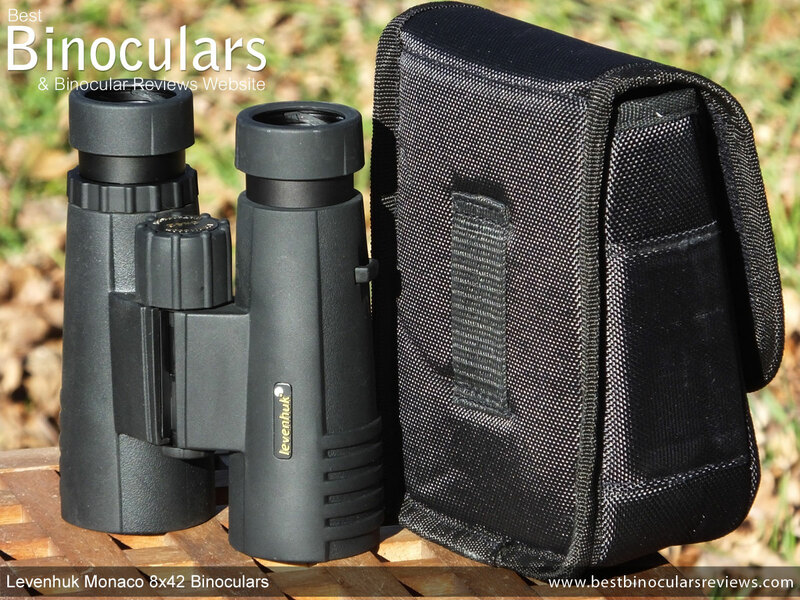 Within the series, the Levenhuk Monaco 8x42 binocular is as with the case of most 8x42's, designed to be a good all-rounder. 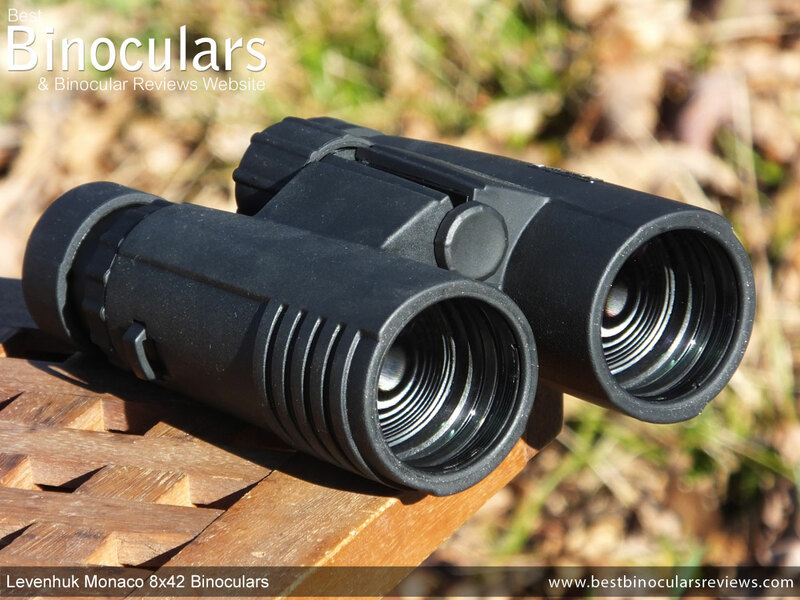 Thus they need to perform well for people like birders, wildlife enthusiasts and hunters to use in a variety of light and weather conditions, or be just as good for those who simply want a pair of optics to keep around the house to be available for a variety of uses any time the need arises. This need to perform well is a very wide range of areas, once again makes it in some ways more difficult to get right than a pair of optics that is aimed more at a specific use or task. 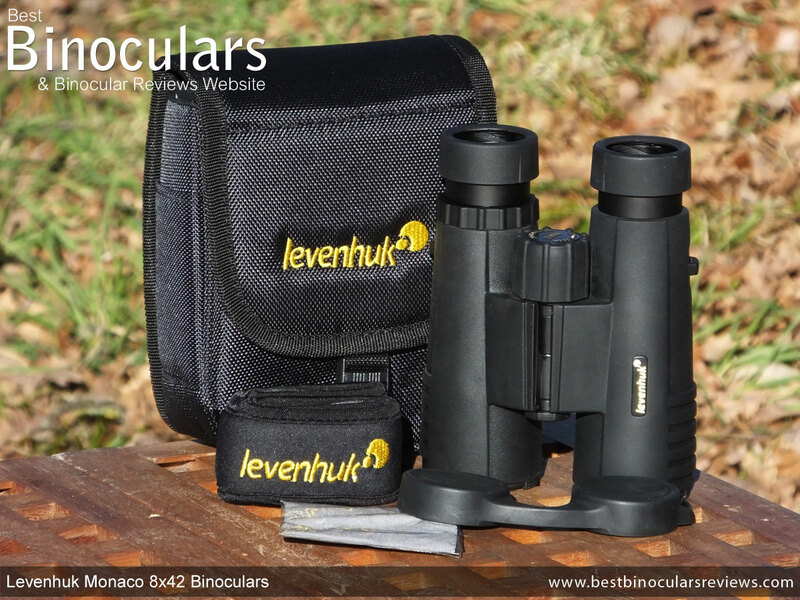 The Levenhuk Monaco 8x42 binocular has a fairly conventional, straight through, single bridged body shape, that is found on many roof prism binoculars. What I do like is that the bridge is thin enough to leave plenty of the barrels expose and thus you have a lot to hold onto for a good grip when glassing, but as well as when you are carrying them about in your hand for example. 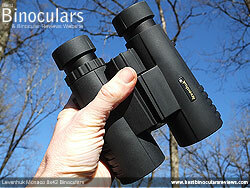 As with the bulk of binos within this price range, these Levenhuk's come with a polycarbonate plastic shell. The main reason for using this material is that it is cheaper to make than the magnesium or aluminium ones and whilst it may not offer the same feeling of quality or be quite as strong, it is still for the most part a tough and lightweight material that does not corrode. The body on these Levenhuk Monaco binoculars is fully sealed and they are described as being waterproof although no recognized standard or depth is mentioned in the product details. However I am sure it is fine for most usual uses in the rain and will also stop small particles like dust from getting inside. The interior of the body has also been filled with nitrogen gas, which prevents the internal optics from fogging up. These, like most modern bins have been rubber coated. The black coating on these is reasonably thick and quite hard, which acts as a reasonably good dampening shield for the optics and other delicate parts inside. Because it is also quite tactile, you also get a nice and secure grip on them which can really help in wet conditions or when using gloves. The under section of the 8x42 Monaco is plain and they lack any thumb indents that you sometimes see. The two loops that are used to fasten the neck strap to are located in the traditional position on the sides of each barrel. Whilst not made from metal, they look to be part of the main shell mould as opposed to attached to it and so feel very strong and secure. 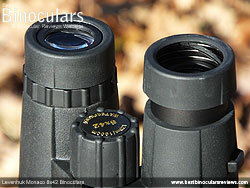 The objective lenses are set back fairly deeply from the ends of the barrels at about 7mm. This helps safeguard them from physical damage as well as provide a small shield against falling dust and light rain for example. By removing the front dust cap, you expose a thread which you can then screw in a standard tripod adapter and thus easily mount this binocular onto a tripod. This is an important feature for those who want to achieve the most steady view possible for example if you wish to attach a camera adapter like the Carson Universal Optics Adapter and take pictures through the bin (digibinning), or for those who want to keep their bin pointing at the same position for long periods of time. The distance between the two eyecups can be changed to match that of the distance between your two eyes (Inter-Pupillary Distances) via the usual way of opening and closing the central hinge. 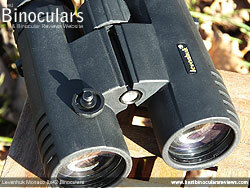 These have a minimum IPD setting of 5.9cm and a maximum of 7.6cm, which is fairly standard. The centrally positioned focus wheel is nice and large (31mm diameter) and has a thick rubber coating on top of what looks to be a plastic shell. This combined with a nice smooth mechanism with just the right amount of resistance and which lacked any undesirable free play made it nice and easy to reach and accurately adjust. To focus from near to far, takes just under 1 full turn of the wheel (360�). This a little less than some which makes large adjustments nice and quick, but in principle also makes sure it is a little more difficult to make small changes. However I never had any problems being able to easily achieve a perfect focus whilst using them. The diopter adjustment wheel which is used to calibrating your binoculars to match your personal vision is found in the usual place near the right eye piece. The best ones are made of metal, lockable and have a fine ratchet system, whilst this one is made from plastic and is neither lockable nor does it have any fine click stops. However there is enough friction to stop it moving too easily by accident and it worked well enough, so nothing to write home about but functional. 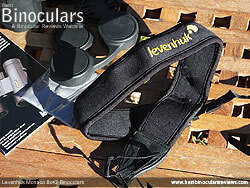 These Levenhuk Monaco's feature twist-up eyecups, that provide you with 18mm of eye-relief. On it's own, this is good, but the actual twisting mechanism works very well with just the right amount of resistance to movement and without any free play or looseness that I sometimes find. If you also combine this with the two click stops in-between fully extended and retracted, then you have a very good eyecup, especially for those who wear glasses. The cups and the eye-piece housing look to be made from a polycarbonate plastic, which may not be quite as robust as the metal ones, but in this mid range level is what I see most often. The cups have a fairly thick and quite hard rubber coating on top of them, which combined with their somewhat large diameter of 41mm makes them satisfactory in terms of comfort and on a par with most. Levenhuk do not mention their official weight on their website, but according to my scales they come in at 694g / 24.4oz without their lens covers on or the neck strap. As is clearly demonstrated in the comparison table below this is about average for a full sized pair of bins, but also makes them one of the heavier ones that use the lighter (but probably not quite as strong) polycarbonate housing. By twisting in the eyecups and removing both objective and ocular lens covers, I measured their length as being 13.9cm (5.5in ) which is how most manufacturers come to their official length. For interest, if you twist out the eyecups, this dimension increases to 14.8cm and then if you add the lens covers it reaches a maximum of 15.4cm, all of which indicate that these are nice and short when compared to the majority of other 42mm bins. By opening their central hinge, I measured their width as being 13.5cm (5.3in) which as you can see positions them on the wider end of the 42mm spectrum. By closing the hinge, their width drops down to 11.2cm. Their height with the hinge open is 5.7cm (2.2in) and 7cm with the hinge close according to my measuring tape and puts them on about par with most other 42mm bins. In order direct the wavelengths so that you get the highest quality image, modern binoculars have compound lenses which consist of multiple layers of glass stuck together. Each shaped in a very exact way and having it's own particular properties. Unfortunately for us, Levenhuk and indeed most other brands do not go into details to the exact make-up so I can't comment to much. But what I can say is that the objectives are 42mm in diameter and the ocular lenses are 22mm in diameter. 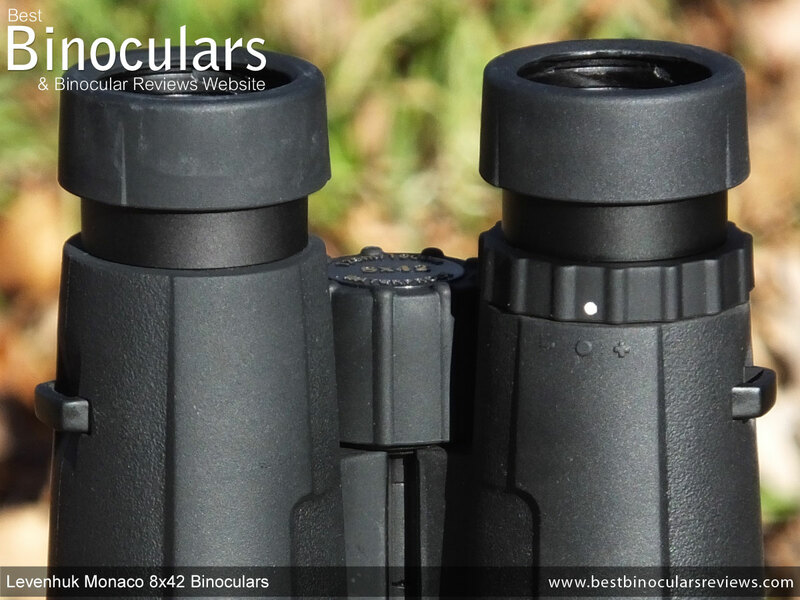 I can also say with some certainty that because they don't highlight it as a feature, these Levenhuk Monaco binoculars do not contain lens elements made from ED (extra-low dispersion ) glass. This is not to say that they don't have low dispersion glass in them, it just does not have extra low dispersion properties. ED glass binoculars can, if designed well produce an image that has less visible color fringing as it offers designer more flexibility and options to better direct the light as it passes through the lens, producing less chromatic aberrations. However I would also like to try and cut through the marketing hype and say that just because ED glass is used, it does not guarantee a better quality image with less color fringing. In my experience, a very well designed binocular without ED glass can look to have as little fringing or even less than a poor or averagely designed one with ED glass. When you get to the Image Quality section below, you will see that whilst I could observe some color fringing through these Monaco's, the amount was minimal and really not any more than that of many I have looked through in this price range that do have ED glass. As well have already discussed, to invert the image before it gets to the ocular lenses and then to your eyes, these use roof prisms created from BaK-4 glass. This is good, because in most cases (when we are talking about binoculars), even the cheaper Phosphate crown BaK-4 glass which has a higher bubble count (and slightly different properties) than the more expensive Schott Barium crown BaK-4 glass, is regarded by experts to be preferable than prisms made from BK-7 glass which is occasionally used on lower priced devices like these. Levenhuk make it perfectly clear that their Monaco bins are "Fully Multi-Coated" which is exactly what we want to hear as it means every surface of glass that light hits all through the optical system has multiple anti-reflection layers on it. This is important because it makes a definite and observable difference in both image quality and brightness as much more light gets transmitted correctly through the device than those bins that only have some glass surfaces that are coated (Multi-Coated) or those with only single layer coatings (Fully-Coated). To ensure that a roof prism performs optically as well a porro prism, they need to have a number of coatings applied to them which I will go over below. But before then I would just like to emphasise that adding these coatings requires a certain amount of expertise and the better performing ones cost more. 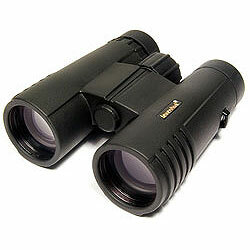 So most cheap and even mid level roof prism binoculars usually use either lower quality, less or even no coatings at all to keep the overall costs down. Unlike the porro prism, a roof prism does not reflect 100% of the light off of every surface as it passes through it. Left unchecked results in less light eventually gets to your eyes, which results in a less bright and lower quality image. Very thin coatings of a highly reflective material can be added to this surface which improves the reflectivity. Apart from doing nothing, the next cheapest option is to add an aluminium mirror coating which increases the transmittance levels to between 87% and about 93%. This is what you will commonly see being used on lower costing roof prism bins. Adding silver mirror coatings cost more but can improve the reflectivity up to about 98%. This is what I most often see used on good quality bins within this price range as it is good compromise between performance and cost. That is why I was really impressed to discover that the Levenhuk Monaco binoculars have the very best dielectric coated prisms which are said to reflect over 99% of the incident light, but which requires far great expertise and cost much more to produce. Which is why you only usually find them on higher end binoculars. 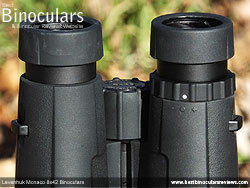 The prisms in the Levenhuk Monaco 8x42 binoculars are also phase corrected, which essentially means that they have another coating that rectifies the phase shift that occurs when light passes through them and ensures that they deliver a higher resolution image with better contrast than those that don't have these coatings. Once again within this is excellent as it is not always found on bins within this price bracket. As you can see from the table above, apart from not using ED glass, which as we have discussed is not always that important anyway, these Monaco's have far better coatings than most of their direct competition and significantly they match those that are more than three times the cost. 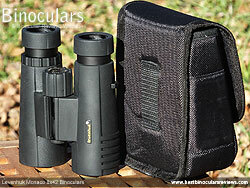 These 8x42 Levenhuk Monaco binoculars have a FOV that is 387ft wide when measured at a distance of 1000 yards away. Or in metric terms it is 142m wide at 1000 meters distance. This equates to a 7.4° angle of view. Whilst as you can see from the comparisons below, this is a fairly good FOV, not the best, but also nowhere near being what I would describe as a narrow view. Thus in my experience and which I can confirm whilst testing their FOV it is perfectly sufficient for most uses and for me was no issue at all. 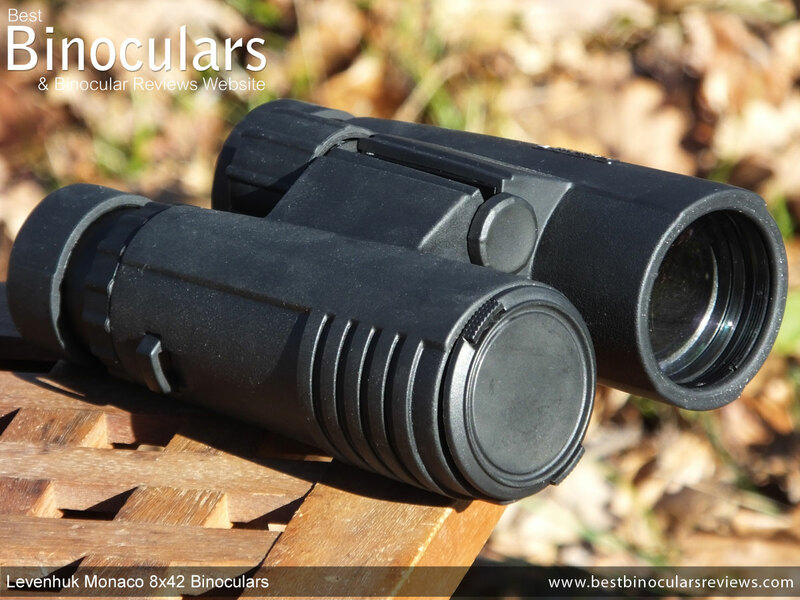 If you take a look at this article on long eye-relief binoculars, for the majority of users, even eyeglass wearers, 15mm is often enough to ensure that you can get your eyes at the right distance away from the ocular lenses to get the full view without any dark rings on the edges. Thus I would describe the 18mm on these as being excellent. Levenhuk advertise these as having a close focus of 4ft (1.2m) which is superb. Indeed I tested the close focus on my sample and measured it to an even closer distance of 3.6ft (1.1m)! Whichever is the case, the close focus on these is up there with the very best standard full sized 8x binoculars that I have tested. 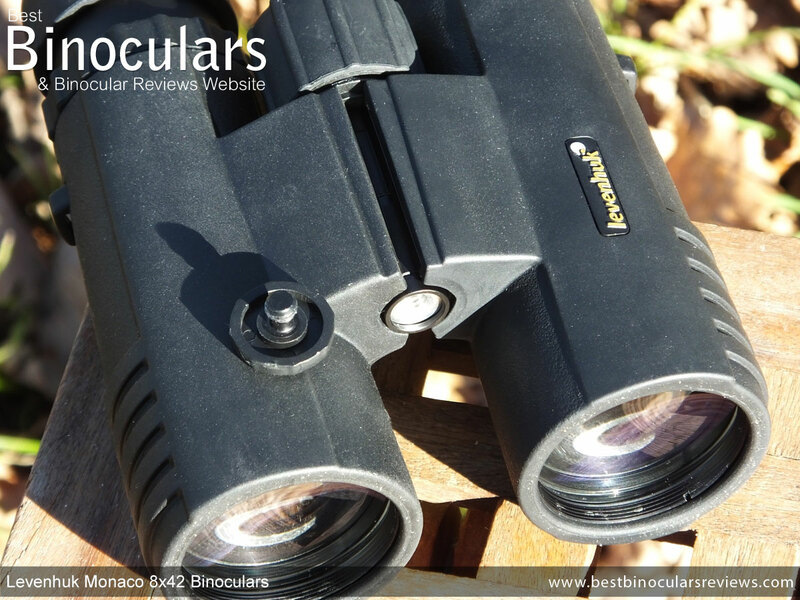 Sure you can get very close focus bins like the excellent Pentax Papilio 8.5x21 binoculars that have a special lens design which means they have a close focus of under 2ft and are purposely made for activities like viewing butterflies, but at 4ft these are ideal for general use and for the occasional look at flowers, insects and even birds at close range. You can have an impressive field of view, all the best glass and coatings in the world, but it all means nothing if the actual image you see whilst looking through the bin is no good. However this is always the hardest part of my review to describe as it is so subjective. To help I compare every bin under the spotlight against a few of my similar configured benchmark bins. 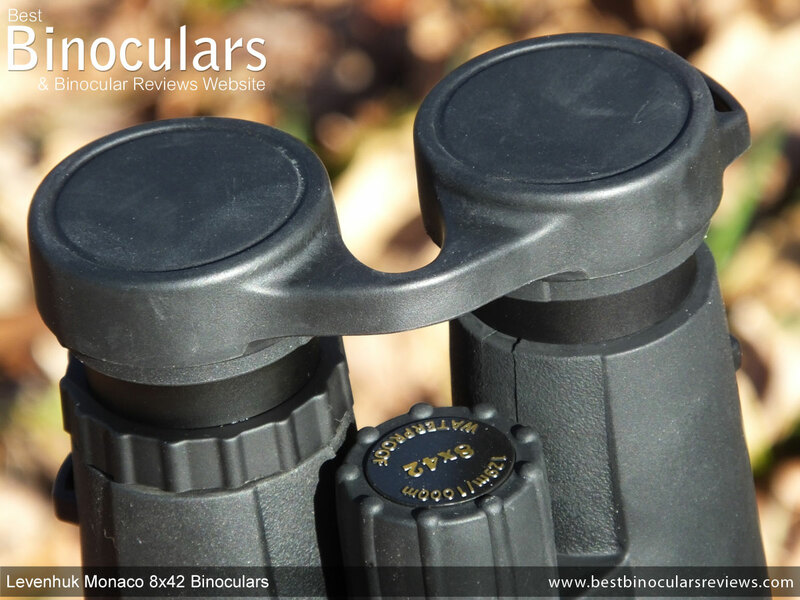 For this review, I compared the view through these Levenhuk Monaco 8x42 binoculars against my 8x42mm benchmark twice, once at around midday in good light then again in the late afternoon at and just after sunset. The observable image you see through these Levenhuk's looks normal to me, which is good as it does not contain any evident unnatural tinting that you can sometimes discern, especially on optics that use cheaper or lower quality glass and coatings. By the same token, the contrast looked good and even though I thought that the image was in most instances, nice and bright, it was not at all washed out and you get a nice difference between light and dark sections. This really helps to add a sense of depth and makes certain objects stand out from their backgrounds. Because these and almost all other 8x42 binoculars produce a large 5.25mm (42÷8) Exit Pupil and thus supply your eyes with more than enough light in bright conditions when your pupils in your eyes are small, I was expecting to observe that the image brightness on these and that of my benchmarks would be the same... and it was. It is in bad light when your pupils are dilated and the bins may not be offering them more than enough light, that any differences made by better quality glass and coatings can sometimes make a more obvious and observable difference. In this case, I thought at once again these were as bright as the benchmark and thus it leads me to rate them as very good and easily on a par with the better 8x42mm binoculars in this price bracket. If you look very closely around the edges of an object that contrasts with it's background through most pairs of binos, you will quite often be able to see a thin coloured line that follows the border. This is known as color fringing and is caused by chromatic aberrations. To reduce this fringing, almost all good quality modern binoculars, including these Levenhuk's use glass elements within the lenses that have special low dispersion properties that can better direct the wavelengths of light. Some binoculars go a step further and employ extra low dispersion (ED) glass, which these don't have, but as I mentioned in the optics section above, this does not mean that they will automatically perform any less better in this area than all of those that do. This is something that I can confirm with my tests and whilst there is a certain amount of fringing, it is minor and only really apparent when you are actually looking for it. I would also like to point out that it is no more than the majority of mid-level optics, including many of those that do used ED glass. I did not observe any obvious "pin-cushioning" or "barreling", two types of distortions that can affect the central part of the image and to me it looked nice and flat as well as sharp when properly in focus. Like almost all bins, there is some blurring of the image right at the edge of the view, but the amount is very minimal and about as good as it get in this class. The soft carry case is very similar to the majority of ones out there and looks to me to be made from something like woven nylon, which then has a padded internal liner sewn into it. Overall it looks to be of a good quality with excellent quality stitching. The padding is fairly lightweight, but should provide just enough protection for all but the heaviest impacts. The lid is basically a flap that folds over the top and front of the case. This design means that they don't need their own carry strap as you can simply thread the straps on your binoculars through each side of the lid. On the rear face is also belt loop for those who want to carry their bins on their hip. The lid is held closed with a single quick release clip, which I prefer to some of the Velcro fasteners that usually make more noise as you open them, which can lead to you frightening away your potential sighting. However this single point is perhaps not as secure as the better Zip fasteners and small items can escape through the spaces if you are not careful. Whilst there are no internal pockets, there are two small pockets on the sides that you can use to store a few personal items, but will need to be careful as they cannot be closed securely. The bins fit very well within the case and I really like the way you can store them and still easily close the lid with the lens covers on and the eye-cups extended. I can't tell you how many manufacturers forget this detail and how annoying and unnecessary it is yo have to twit down the cups every time you want to put your binos back in their case. Whilst you can get far more luxurious neck straps which feature real leather and shiny metal parts, the one that comes with the Levenhuk Monaco looks to be of a reasonably high standard and about equal to most of their direct competitors. The neck and shoulder section is made from a soft Neoprene type material and at about 4mm thick and 45mm wide, it offers more than enough comfort than what is needed. The connectors which join the padded section to the thin nylon straps seems to me to be made from a soft plastic/rubber and the stitching is good and so should not easily come apart. 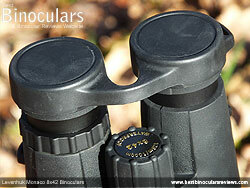 You connect the strap to the binocular in the usual way by threading the thin nylon section through the loops on the sides of the binocular and then back on themselves through the slider that enables you to adjust the length to your want or needs. Whilst not unique, the objective lens covers are a little different to the majority that I see. Instead of being made of rubber and simply fitting over the ends of the objective lenses, these are plastic and have spring loaded clips that allows them to fit securely into the ends of the barrels and are very similar to the lens caps you see on expensive camera lenses. I really like this design as it makes for a far cleaner, more sophisticated, streamlined look. Apart from the aesthetics, for the most part the function is also superior as the connection is also more secure and thus it is really unlikely that they will come away unless you want them to. The only down side is that unlike the rubber cup ones that have a loop that tethers them to the binocular and so they just hang down under the bin when you are glassing and always available. With these you will either have to place them in your pocket or carry bag, which if you are anything like me means that there will be times when you don't replace them when really you should or even worse you misplace or loose them. If you do this there is more chance that you could damage your lenses or at best get dust all over them which means more frequent cleaning. The soft plastic/rubber rain guard is like most others in design and does a good job of protecting the eye-pieces. It has a good tight fit over the eye-cups so should not come away by accident and the bridge between the two cups is nice and flexible so that you can easily put it back onto the bin, no matter what you have set your inter-pupillary distance at. Once cup on the guard also has a small loop on the side of it which enables you to easily thread the neck strap through to keep them tethered should you wish. You will also find a cleaning cloth inside the box. Whilst it is of a good quality and about the same as most others, I would still only use it for general cleaning of the body and perhaps only emergency use on the lenses when out in the field. Remember excessive rubbing can scratch the coatings on the lenses and it is for this reason I highly advise that you get a specialist photographic type lens cleaning kit to thoroughly clean the glass. The included user manual is like that found with most bins, generic, fairly basic and written in a wide range of languages. This one includes information on how to adjust the interpupillary distance, the diopter setting, focussing, the twist-up eyecups and cleaning. Also included are the details of their international warranty. 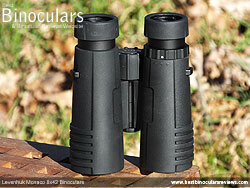 It states in the booklet that Levenhuk offer a 3-year warranty on these bins, but I can confirm that this is old information which has not yet been updated and that all Levenhuk telescopes, microscopes, binoculars and other optical products, except for accessories now come with a lifetime warranty. The table below compares the main stats and features of this Levenhuk binocular with that of other full sized bins with 8x magnifications. 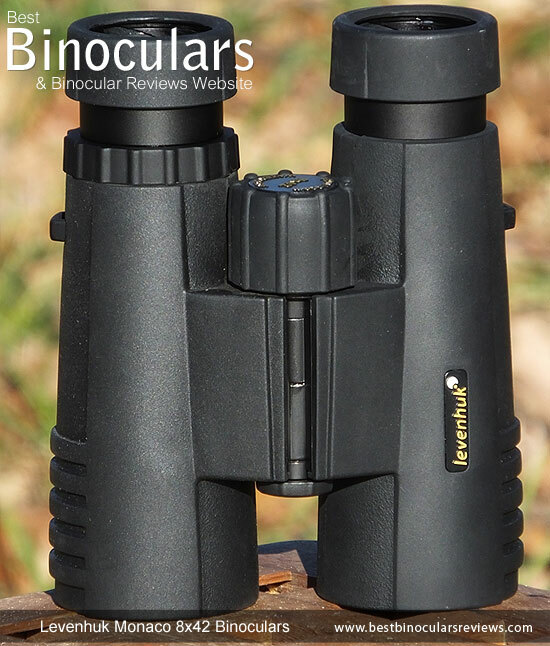 I began this review by wondering if Levenhuk had managed to pull off the difficult task of producing a comparatively high performance 8x42 binocular that would please a wide variety of users in a wide range of conditions and yet do not cost too much. Well I can say that features like their fully multi-coated optics, dielectrically coated as well as phase corrected prisms combined with a relatively wide field of view, good close focus and plenty of eye-relief has resulted in an optical performance that in my opinion matches that of some far more costly bins. Whilst even though the fully water and fog proof body is made from a polycarbonate plastic which may not quite match all the attributes of higher costing materials like magnesium, it is by comparison strong lightweight and backed up with a lifetime warranty should anything go wrong. 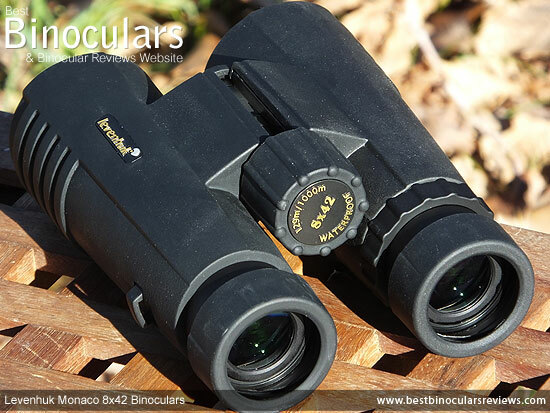 Strong Points: The 4ft minimum close focus on these 8x42 Levenhuk binoculars is excellent and places up them with the best that I have ever used. The 18mm is also first-rate and when you also factor in the good quality twist-up eyecups that have two intermediate click stops for flexibility, these are an ideal choice for eyeglass wearers. For me, I think one of the strongest points to these Levenhuk binoculars is that they really do not have any major weaknesses. Specifications like their size, weight, field of view, and eye-relief , whilst not spectacular are all good to very good which is most certainly not always the case within this or indeed higher price brackets. The fact that they have dielectric coatings on the prisms is also really impressive as most of their direct competition will use lower performing materials like aluminium which is far cheaper. Weak points? As I have already mentioned, for a binocular costing this much, they really do not have any major weaknesses that I feel are deal breakers. Some may see the lack of ED glass elements in the lenses as a weakness and even though there is some observable color fringing, I feel that the amount is reasonably small and in some cases no worse than what I have seen on similar priced bins that do use ED glass. Whilst I really like the objective lens covers and the way they clip into the ends of the barrels is far better looking and works better than the simple rubber cups that you usually get, but I really wish they had some sort of way of keeping them attached to the bin when you are glassing. I seem to have a habit of misplacing loose pieces like lens covers and then have to spend ages looking around for them to replace when I would much rather be moving onto the next sighting. It is a small detail and for most will not be an issue, but for me it is something that could easily be fixed without adding much, if any cost to the product. Ideally I would also have wished for a wider FOV and perhaps more luxurious features like a magnesium body, a machined aluminium focus wheel, metal eye-cups, lockable diopter ring and a genuine leather carry case. But at this price it is unrealistic to expect everything and so something has to give and I would much rather see the small compromises that Levenhuk have made than if they were to have cut back on the most important optical components and coatings. 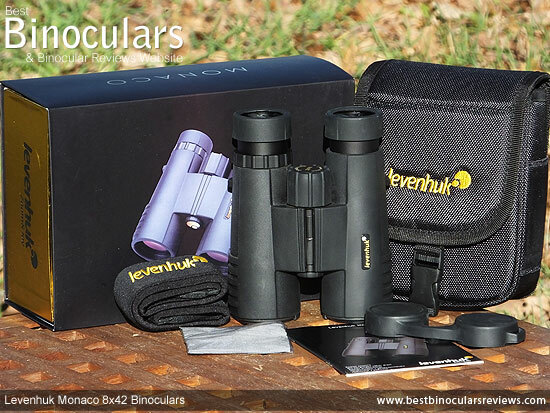 Ideal Uses: I think Levenhuk have succeeded in producing a good quality, lowish costing general use 8x42 binocular and thus they will perform well enough to please most users in a wide range of areas including general birding, hunting and wildlife observation trips. The very close focusing distance also makes these bins and ideal choice if you often like to take a better look at things like flowers, butterflies, dragonflies and other insects as well as birds that are nearer to you. As a binocular you keep around the house and use out in the back garden for spotting birds etc, these are ideal. I'd like to reassure you that I have been completely impartial whilst writing this Levenhuk Monaco 8x42 binocular review which is indeed also the case for all other reviews on BBR. The thoughts expressed on this page are completely my own and honest opinions and I believe the facts and figures to be correct at the time of writing. However this is not to say that I am always right and never make mistakes, so if you spot an error, please feel free to drop me a line to let me know and I will correct it.